The goal of mentoring at APA is to develop the next generation of planning professionals by pairing experienced individuals with those who want to learn more about their chosen profession. APA believes that supporting healthy relationships between mentors and proteges provides immediate and long-term benefits for the individuals and the profession. The mentoring relationship is dynamic and flexible. Join us in growing the community of planning professionals. Take part in mentoring at NPC19! Signing up for Mentor Match and connecting with a conference mentor or mentee is easier than ever. New this year, you must enroll in Mentor Match via APA Engage. Once you’re enrolled, fill out your profile and use the convenient self-service system to find, communicate, and match with a motivated mentor or mentee. Ensure compatibility with your mentoring partner by creating and maintaining a robust profile. 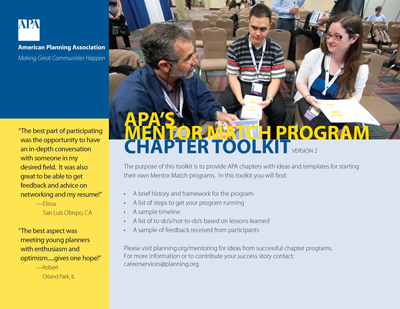 Mentor Match reflects APA’s commitment to supporting all members’ professional development. If you have any questions regarding the program or enrollment process, please email careerservices@planning.org. The AICP Candidate Pilot Program offers qualified APA members the opportunity to take the AICP Certification Exam prior to earning professional planning experience. An optional mentoring component will be a key benefit for many program participants, and we are currently assembling a pool of outstanding mentors to work with them. Help us identify and encourage experienced planners to become mentors, or sign up to become one yourself. The opportunity to serve as a mentor is open to all AICP members and offers pro bono CM credit. Mentors and program participants will be paired based on shared interests. Those interested in becoming a mentor sign up by completing the mentor application. Check at the local chapter level for opportunities to find a mentor in your area. A mentor can help shepherd your career and be a sounding board. Mentors give back to the profession and ensure the future of planning is in good hands. By serving in a mentoring role in the complex world of planning, you are furthering professional development and shaping the future of planning. As an advocate, a mentor can help a protege by providing knowledgeable and strategic advice, and a mentor can offer the perspectives that come only from experience to encourage the protege to build on core capabilities or pursue an innovative opportunity. Each relationship is different. Claim pro bono CM credits for mentoring. Use as a tool for succession planning. Increase retention and development of knowledge and intellectual capital. Encourage individual growth and development. Gain a sense of renewed purpose and/or approach to problem-solving. "The best aspect was meeting young planners with enthusiasm and optimism ... gives one hope!" "Getting to meet young planners and share thoughts, ideas, emerging trends from old and new school perspectives [was the best aspect]." Make the most of your student membership with APA. The classroom may not fully prepare you for the working world. Taking part in a mentoring relationship is the bridge between practical and applied knowledge. As a protege, you will grow your personal and professional knowledge and network. Your participation is a way to form a professional connection that can lead to opportunities beyond a typical job search. Focus on your career path and long-term goals. Get advice based on real-world experiences. Create a lasting professional relationship. Gain a new approach to problem-solving. Get insight from alternative areas. Get recommendations for specific managerial practices. Connect with a confidant on workplace concerns. "Getting to engage with a professional in a more-or-less structured context [was the best aspect], particularly since it was my first conference and I didn't know many people there. It was a great springboard to meet people!"